It’s not always easy to explain exactly what’s going on with a patient’s oral health because they simply cannot see what the dentists see. Our verbal descriptions can only go so far, but as the saying goes, a picture is worth 1000 words. That’s why intraoral photography has had such a profound impact on patient education and treatment planning. At Rogersville Family Dentistry, Dr. Timothy D. Gunnin and his dedicated team, are able to capture images of any areas of concern, and show these clear, high-definition images to patients right away on a chairside computer monitor. Patients then become full participants in their treatment planning process as we show them where to target at home care, explain and demonstrate the potential results of various treatments, and more. Contact our team to find out more or schedule an appointment today. Capturing intraoral photos is fast, easy, and completely comfortable. Our dentist, a dental assistant, or hygienist simply inserts a pen-like camera wand into the mouth. Don’t worry, we follow strict sanitation standards, and use disposable shields to ensure patient health and safety. With a few clicks, we have crystal-clear images of anything we may need to discuss with the patient. 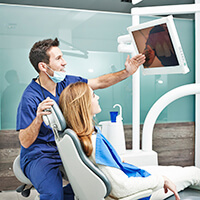 The images recorded by these intraoral cameras are instantly transmitted to our chairside computer monitor where patients and dentists can revue and discuss them. With the introduction of intraoral photography into our Rogersville dental office, our patients have transformed from taking a bystander role in their dental care to fully partnering with us to choose the treatments that meet their needs and smile goals.